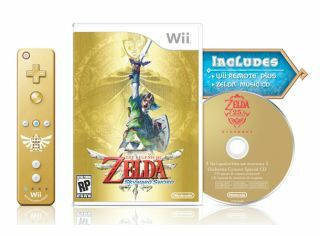 The Legend of Zelda: Skyward Sword will arrive in the US on November 20th boasting a special edition gold Wiimote MotionPlus bundle. The new Zelda title, which is probably the last major title before the Wii U takes centre stage, will boast the underutilised MotionPlus tech, which offers gamers improved accuracy. You'll need a MotionPlus Wiimote to be able to take part in Link's latest adventure, hence Nintendo is hoping fans will opt for the bundle. The limited edition bundle, which will also feature a 25th anniversary orchestral performance of the game's music on CD, will cost $69.99, while the standalone game will be $49.99. "As an additional 25th anniversary treat for fans who purchase the game early, every copy in the initial production, whether sold by itself or as a part of the limited-edition bundle, will come with a free CD featuring select orchestral arrangements of iconic music spanning the history of the franchise which will be performed at The Legend of Zelda 25th Anniversary Symphony Concert performances in October 2011," says Nintendo. There's no word of a similar deal in the UK, where the game launches two days earlier on November 18th. Nintendo has alread confirmed that a Zelda title will be among the headline titles for the new Wii U console when it launches in Spring 2012.